Potatoes don't necessarily need a lot of room in order to grow them effectively. If you have room for a car tire placed flat on the ground, you can grow four to five potato plants with lots of potatoes on them. 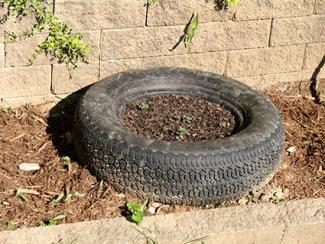 Make a planter out of tires using easy-to-follow instructions. The planter is constructed in several stages over the course of the growing season as the potato plants grow. To begin the planter, select an area that gets at least six to seven hours of sun each day. Lay one tire down in that area. Fill the tire interior with topsoil to the upper rim. Cut two seed potatoes into thirds, making sure each potato piece has several eyes on it. Plant the pieces around the edge of the interior of the tire, spacing them equally. The eye side should face up. Place another tire on top of the first one. As the potato plants grow, add dirt to this tire interior. Keep the plants covered with dirt, with only the top four or five leaves showing in the planter. Add another tire when the potato plants reach the top of the second one. Continue adding dirt to cover all but the top four or five leaves of the potato plants. Add a fourth tire if necessary. The potatoes are ready to harvest when the plants die and fall over. Carefully remove the top tire and remove the dirt from around the potatoes. Continue doing this, tire by tire, until you reach the ground beneath the first tire. Each plant should have multiple potatoes on it. Remove the potatoes from the roots of the plant. Spread them out in one layer in a cool, dark place to dry. Place in a dry, cool, and dark place to store for up to six months. Use only certified seed potatoes. These potatoes are certified to be disease-free. You don't want to introduce potato blight into your garden -- it kills more than potatoes. Disease free potatoes are often sold at feed stores and nurseries. Don't use potatoes bought from the produce department of the grocery store. These are sprayed to keep them from sprouting and will not yield a good crop. Water the potatoes twice a week. Make sure the water reaches all the way to the bottom of the bottom tire each time so those roots don't dry out. Plant potatoes about six weeks before the date of your average last frost. You will know approximately the right time to plant them when they start appearing in the feed stores and nurseries in your area. 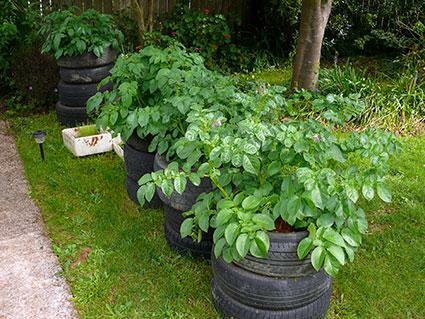 A tire planter is a good place to raise potatoes. It recycles tires, keeps you from having to dig trenches, and keeps the potatoes contained and happy while they grow. You can construct multiple beds to grow all the potatoes you need for your family and your only expenses are the dirt and the potatoes. Good luck growing your potatoes the green way.